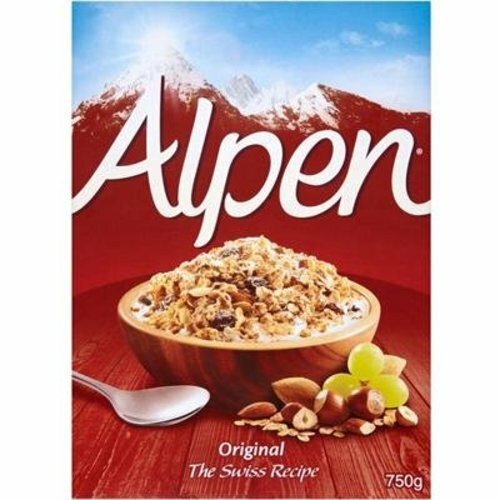 375g Alpen Original isÂ the original Swiss style muesli, packed full of the finest natural ingredients and classic muesli taste. Every bowlful is filled with juicy raisins, crispy wheat flakes, roasted hazelnuts and almonds and rolled oats, so it's high in fibre and tastes delicious.Â But then, you knew that already: we know you know how good it is. But have you ever tried adding toppings to your Alpen? If you throw in a handful of fresh strawberries, raspberries or blueberries you can give it a whole new delicious spin. And why stop there? Were sure that you could come up with some suggestions worth yodelling about. Alpen Original contains the following ingredients: Wholegrain Wheat (37%), Wholegrain Rolled Oats (34%), Raisins (12.5%), Sugar, Dried Skimmed Milk, Milk Whey Powder, Roasted Sliced Nuts (2.5%) (Almonds & Hazelnuts), Malted Barley Extract, Salt.